CC’s Coffeehouse opened its first Livingston Parish location last year in Denham Springs as a part of a rapid expansion plan. Hayden said he was excited to open in Livingston Parish. He has been a Denham Springs resident for 12 years and is committed to the growth and prosperity of the community. Forbes, as well as new Livingston Parish Chamber board members, will be sworn in at the Annual Meeting. Also, the prestigious Best in Biz winners will be announced for 2019. Past winners include Jefferson Financial Federal Credit Union and Gator Millworks and more. The Annual Meeting & Awards Banquet will be held on Jan. 23 at Forrest Grove plantation at 11:30 am. The event has a fun atmosphere and highlights businesses that are improving and growing Livingston Parish. 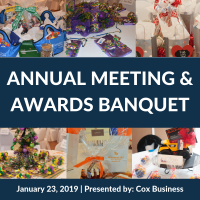 This year’s Annual Meeting is presented by Cox Business. RSVP at www.livingstonparishchamber.org.